Property Location When you stay at Hotel Alexandros in Chalkidona (Anchialos), you'll be within the vicinity of Insectopia. This hotel is within the region of Thessaloniki State Museum of Contemporary Art and Cinema Museum.Rooms Make yourself at home in one of the 74 air-conditioned rooms featuring refrigerators and flat-screen televisions. Rooms have private furnished balconies. Complimentary wireless Internet access keeps you connected, and satellite programming is available for your entertainment. Bathrooms have bathtubs or showers and hair dryers.Dining Take advantage of the hotel's 24-hour room service. Quench your thirst with your favorite drink at a bar/lounge.Business, Other Amenities Free self parking is available onsite. 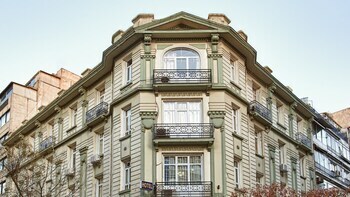 This hotel is situated in Thessaloniki. 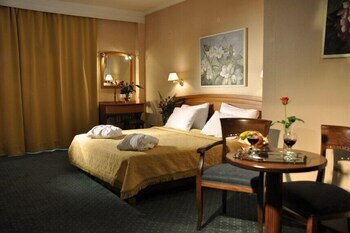 The hotel provides luxury and comfortable lounges. 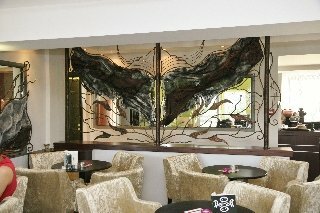 It promises guests a unique and luxurious experience and offers them a range of facilities including a lobby, bar, restaurant and room service. The guest rooms are divided in three different categories in order to cater for the tastes of all guests. Each comes equipped with a double bed, a private bathroom with shower and bathtub, satellite TV, a minibar, office desk, telephone, minibar, Internet access, balcony and air conditioning. Some of the rooms have a private hot tub. There are also 4 luxury suites promising the most comfortable stay possible. The suites feature a double bed, leather couch, a bathroom with double bath, hot tub and private TV, a breakfast lounge, TV, minibar, office desk, phone, Internet access and a balcony.From the date of: 31/12/2017 Service Tax payable directly at the hotel.From the date of: 01/11/2018 City Tax payable directly at the hotel. Property Location With a stay at Assembly Hotel in Chalkidona, you'll be within the region of Insectopia and Church of Panagia Chalkeon. This hotel is within the region of Thessaloniki State Museum of Contemporary Art and Cinema Museum.Rooms Make yourself at home in one of the 88 air-conditioned rooms featuring refrigerators. Satellite television is provided for your entertainment. Private bathrooms have complimentary toiletries and hair dryers. 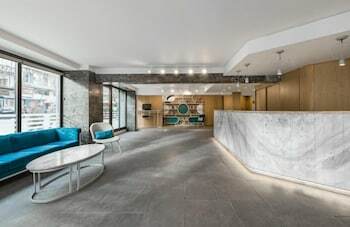 Conveniences include phones, as well as desks and a turndown service.Rec, Spa, Premium Amenities Enjoy recreation amenities such as an outdoor pool or take in the view from a garden. This hotel also features complimentary wireless Internet access, concierge services, and a fireplace in the lobby.Dining Satisfy your appetite at the hotel's restaurant, which serves breakfast, lunch, and dinner. Dining is also available at a coffee shop/café, and room service (during limited hours) is provided. Quench your thirst with your favorite drink at a bar/lounge.Business, Other Amenities Featured amenities include dry cleaning/laundry services, a 24-hour front desk, and luggage storage. Free self parking is available onsite. Property Location With a stay at Aegeon Hotel, you'll be centrally located in Thessaloniki, walking distance from Jewish Museum of Thessaloniki and close to Church of Panagia Chalkeon. 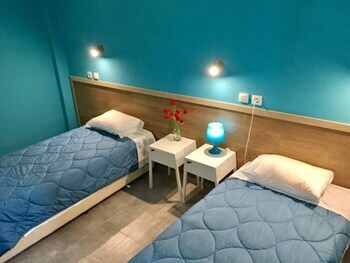 This hotel is within close proximity of Ancient Agora Square and Aristotelous Square.Rooms Make yourself at home in one of the 59 air-conditioned rooms featuring refrigerators. Complimentary wireless Internet access is available to keep you connected. Private bathrooms with showers feature complimentary toiletries and hair dryers. Conveniences include phones, as well as desks and blackout drapes/curtains.Rec, Spa, Premium Amenities Make use of convenient amenities such as complimentary wireless Internet access, concierge services, and tour/ticket assistance.Dining Grab a bite from a snack bar/deli, or stay in and take advantage of the hotel's room service (during limited hours). Quench your thirst with your favorite drink at a bar/lounge.Business, Other Amenities Featured amenities include dry cleaning/laundry services, a 24-hour front desk, and multilingual staff. Property Location With a stay at Kinissi Palace in Thessaloniki, you'll be minutes from Jewish Museum of Thessaloniki and Church of Panagia Chalkeon. This 4-star hotel is within close proximity of Ancient Agora Square and Aristotelous Square.Rooms Make yourself at home in one of the 52 air-conditioned rooms featuring refrigerators and minibars. Complimentary wireless Internet access keeps you connected, and satellite programming is available for your entertainment. Private bathrooms with bathtubs or showers feature complimentary toiletries and hair dryers. Conveniences include safes, housekeeping is provided daily, and cribs/infant beds (complimentary) can be requested.Dining Take advantage of the hotel's room service (during limited hours). Quench your thirst with your favorite drink at a bar/lounge.Business, Other Amenities Featured amenities include dry cleaning/laundry services, a 24-hour front desk, and luggage storage. This hotel has 2 meeting rooms available for events. 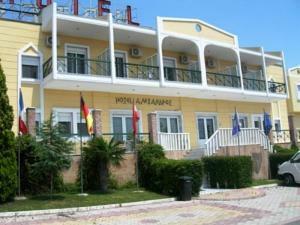 Localizare centrala, convenabila, stil simplu, internet, parcare gratuita, room service. Potrivit pentru o vacanta economica, in apropiere de centrul orasului Salonic. Enjoying an enviable location, just 1 km from the centre of Thessaloniki and only 12 km from Macedonia airport, this hotel takes great pride in its accessibility. This hotel ensures that guests here will feel as though they are travelling back in time, exploring a distinctive period of Greek history. Displaying traditional paintings and frescos, guests will be enchanted by the hotel interior. 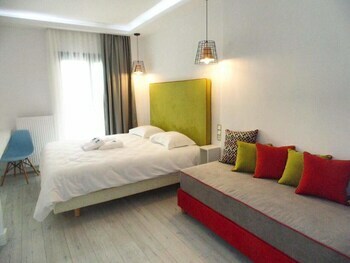 The guest rooms are spacious and colourful, utilising quality fabrics and minimalist furniture. 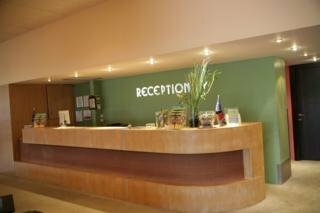 The hotel provides a meeting room for guests travelling for business purposes. The hotel provides breakfast each morning, ensuring an ample selection for guests to choose from. Whether travelling for business or pleasure, guests can relax and unwind in the comfortable surroundings of this hotel.From the date of: 31/12/2017 Service Tax payable directly at the hotel.From the date of: 01/11/2018 City Tax payable directly at the hotel. Property Location Located in Oraiokastro, Galaxy Design Hotel is within the vicinity of Insectopia and Thessaloniki State Museum of Contemporary Art. This hotel is within the region of Byzantine Walls and Church of Hosios David.Rooms Make yourself at home in one of the 31 individually decorated guestrooms, featuring refrigerators and flat-screen televisions. Rooms have private balconies. Complimentary wireless Internet access keeps you connected, and satellite programming is available for your entertainment. Private bathrooms with bathtubs or showers feature hair dryers and slippers.Rec, Spa, Premium Amenities Pamper yourself with onsite massages or take in the view from a garden. 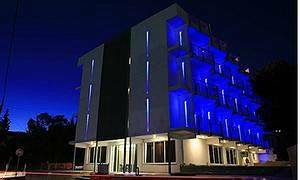 Additional features include complimentary wireless Internet access and tour/ticket assistance.Dining Enjoy a bite to eat at a coffee shop/café, or stay in and take advantage of the hotel's 24-hour room service. Quench your thirst with your favorite drink at a bar/lounge.Business, Other Amenities Featured amenities include express check-in, express check-out, and a 24-hour front desk. Free self parking is available onsite. 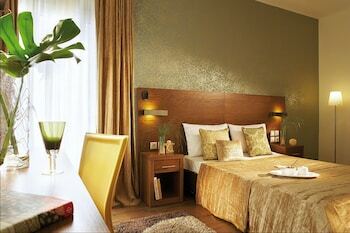 Situated in the city centre of Thessaloniki, Egnatia Hotel is completely renovated and absolutely unique in decoration and comfort. Egnatia Hotel is within easy reach of the archaeological museum, the Byzantine Museum, the White Tower, shops and night life.